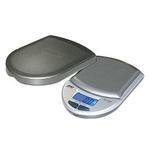 A&D’s HJ-150 compact scale is suitable to carry with you anywhere in your pocket, bag or briefcase! 60 (W) x 64 (D) mm / 2.36 (W) x 2.52 (D) inch. 66 (W) x 98 (D) x 20 (H) mm / 2.60 (W) x 3.86 (D) x 0.80 (H) in.